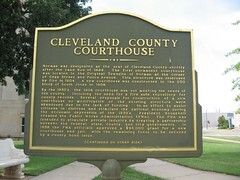 Norman was designated as the seat of Cleveland County shortly after the Land Run of 1889. 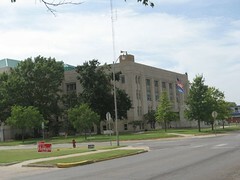 The first permanent courthouse was located in the Original Townsite of Norman at the corner of Gray Street and Ponca Avenue. This structure was destroyed by fire in 1904. A new courthouse was constructed in the 200 block of South Jones in 1906. By the 1930's, the 1906 courthouse was not meeting the needs of the county, including the need for fire safe repository of county records. Several proposals for construction of a new courthouse or modification of the existing structure were abandoned due to the lack of funding. In an effort to assist citizens in distress and stimulate the national economy during the economic depression of the 1930's, President Roosevelt created the Public Works Administration (PWA). The PWA was intended to stimulate private industry by creating a partnership between the federal, state, county, and city governments. 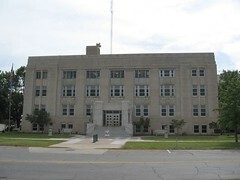 In 1938 the PWA officials approved a $94,000 grant for a new courthouse and jail, with the remaining funds to be secured by a county bond issue. Noted OKC architect Walter T. Vahlgert designed the new courthouse directly in front of the existing courthouse which continued to function while the new courthouse was being built. Tankersley Construction Company of Oklahoma City constructed the courthouse at a total cost of $209,090. The combination of the Classical Revival form with Art Deco ornamentation was popular for public construction projects in the late 1930's and early 1940's, particularly for projects funded by the PWA. Prisoners were transferred in the new structure on June 11, 1940. The 1906 courthouse was demolished by Works Projects Administration (WPA) workers in the early 1940's. 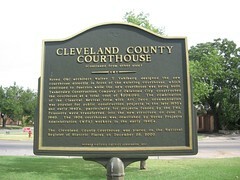 The Cleveland County Courthouse was placed on the National Register of Historic Places on December 28, 200. Norman Historic District Commission 2001. Architect, builder, or engineer: Vahlberg, Walter T., Tankersley, Construction Co.